Paleontologist Elmer S. Riggs, assistant curator of geology at the Field Columbian Museum in Chicago (now, the Field Museum of Natural History), and his crew of one field assistant/photographer and a field assistant/camp cook excavated a quarry on the east side of Dinosaur Hill during the summer of 1901. The previous year, the crew had excavated the first Brachiosaurus ever discovered, from a site near Grand Junction (now, Riggs Hill). 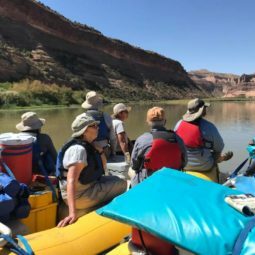 The crew camped under cottonwood trees along the banks of the Colorado River (then, the Grand River) not far from here and worked the dinosaur quarry each day. 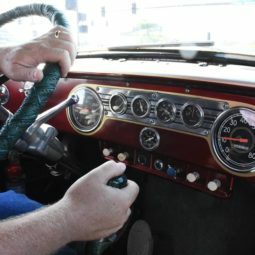 The crew would have to ferry both equipment and bones across the river. When the dinosaur they were chasing turned out to run straight into Dinosaur Hill, they enlisted the help of local miners to blast a tunnel into the hillside. They found the back half of the skeleton of a 70-foot-long plant-eating dinosaur called Apatosaurus at this quarry. This skeleton is still mounted at the Field Museum of Natural History in Chicago. Elmer Riggs was intrigued by this skeleton and began a study of these animals and others similar to it. Based his results, he concluded in 1903 that Apatosaurus and Brontosaurus were two names for the same type of animal, the only differences were changes in the skeleton due to age. And since the name Apatosaurus had been published first, it had priority, and the name Brontosaurus was no longer valid. However, the name persisted in pop culture long after that. 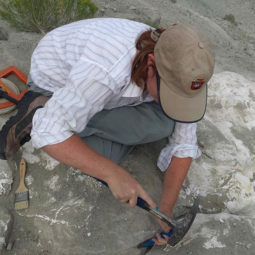 Between 1992 and 2004 paleontologists from the Museums of Western Colorado excavated on west side of Dinosaur Hill and found an assortment of animal fossils from the same rocks as Riggs’ Apatosaurus quarry. These included a juvenile Camarasaurus, a juvenile Stegosaurus, turtles, crocodiles, meat-eating dinosaurs, a small lizard-like reptile called a sphenodontid, and a specimen of the rare flying reptiles known as pterosaurs. All these were found in a quarry the size of a dining-room table! Dinosaur Hill is located within the McInnis Canyons National Conservation Area and is owned/managed by the Bureau of Land Management, the Museums of Western Colorado, and the City of Fruita. 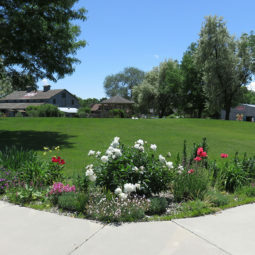 The historic Riggs quarry site was donated by the Eugene Fletcher family, and the kiosk was built by Lyle Nichols with funding from the Colorado Lottery.